Altitude of MPF: -3.682 km. Viking 1: -3.627 km (most similar to Pathfinder). Based on scale height calculations, at a time when pressure at areoid is 6.1 mbar, pressure at Viking 1 would be expected to be about 8.5345 mbar and at Pathfinder it would be about 8.5781 mbar. The relevent pressure text and figures from the above article are include below. This author's comments are added in red. Pressure data. During sols 1 through 30 (Roffman note: Martian sols 304 to 333; Ls 142.7 to 158) surface pressure at the landing site underwent substantial daily variations of 0.2 to 0.3 mbar, which were associated primarily with the large thermal tides in the thin martian atmosphere (11) (Fig.3A). Daily pressure cycles were characterized by a strong semidiurnal oscillation, with two minima and two maxima per sol, together with diurnal and higher-order components, although there was considerable day-to-day variability (Fig. 3B). The presence of a large semidiurnal tidal oscillation is indicative of atmospheric dustiness over broad regions of Mars and over an altitude range of at least 10 to 20 km (19). UPDATE OF 11/19/2014: Schofield et al. (1997)1 indicate that while Pathfinder was operational from July 4 to September 27, 1997, it had no pressure data for the most crucial sol – its first operational day on Mars. The reason given by the above reference is there were “various spacecraft software reset and downlink problems.” If the problems only occurred after the first day; and if the first day’s pressure data was consistent with the Vikings, then Pathfinder’s data could be used to refute the claims made herein. However, that is not the case. We are still dealing with a Tavis transducer with no way to keep the dust out of its pressure tube on or in the seconds before landing, and no way to change a clogged dust filter. The critical time is in the final landing process. So when the spacecraft has to reset the software and correct downlink problems then, the issue of exactly what is entailed in these corrections becomes one of extreme importance. 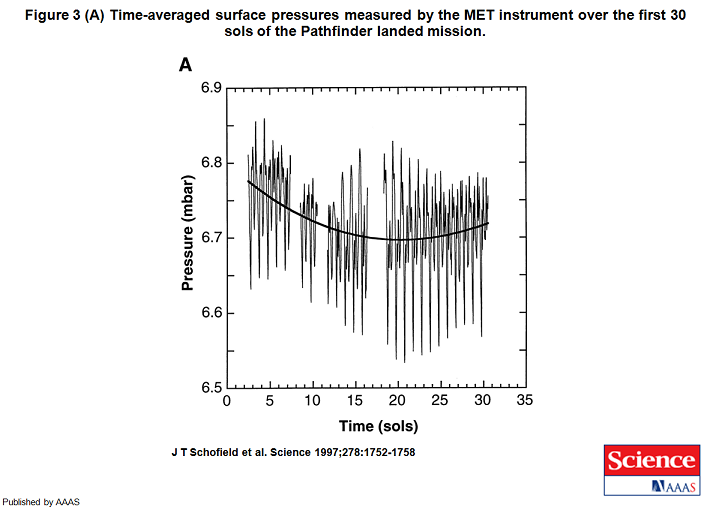 Figure 3 A. Time-averaged surface pressures measured by the MET instrument over the first 30 sols of the Pathfinder landed mission. The averages are primarily over the 3-min default measurement sessions, of which there are nominally 51 per sol; and the resulting points have been connected with straight lines, except for sols 12 through 15, where cubic spline interpolation has been used to fill data gaps of about 8 hours in length. MET operation was restricted to nighttime observations during this period to prevent spacecraft resets associated with MET data collection. The major gaps in the data set at sols 1, 8, 11, and 17 (Roffman note: Mars sols 304, 311, 314 and 320) are caused by various spacecraft software reset and downlink problems. After sol 17, the reset problems associated with MET were corrected, and continuous sampling was resumed. The long-term trend in pressure is represented by a third-order polynomial fit to the data (solid curve). Roffman note: During these days, pressures at Viking 1 varied from 6.51 mbar to 7.11 mbar between Ls 142.7 and Ls 154.017, however there is no Viking data posted for the period from then through Ls 158 so a full comparison is not possible. The pressure of 7.11 mbar is about 0.25 mbar higher than what was seen by the Pathfinder. See right columns on pages D-5 to D-27 of Annex D to our report for the corresponding Viking data. Again, because Viking 1 was about 55 meters higher than Pathfinder, the pressures that it saw should have been slightly lower than what was recorded by Pathfinder. Another major problem here is that beyond the data that is totally missing for Viking 1 from its sols 117 through 133 (Mars sols 325 through 341), for at least 112 basically hourly (59-minute) time bins which is equal to another 4+ Martian days, the pressure readings were stuck for at least 4 time-bins. About 81 of the time bins saw pressure changes in the range of or greater than the 0.088 mbar resolution amount limited by digitization (see page 17 of the Basic Report). This was a bit less than 16% of the recorded pressure changes. Figure 3B. 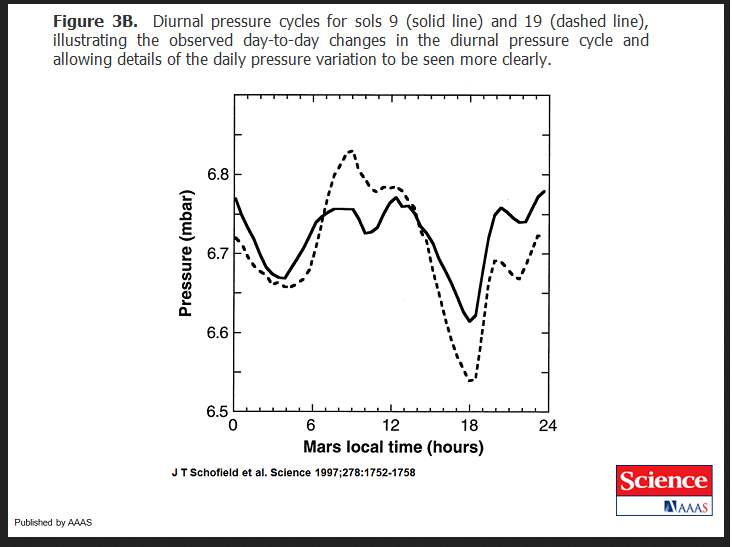 Diurnal pressure cycles for sols 9 (solid line) and 19 (dashed line), illustrating the observed day-to-day changes in the diurnal pressure cycle and allowing details of the daily pressure variation to be seen more clearly. A long-term trend in daily mean pressure was also seen. A third-order polynomial fit to the data shows that mean pressure fell slowly at the beginning of the period and rose at the end, with a minimum just under 6.7 mbar near sol 20 (L s ∼ 153°) (Fig. 3A). This time corresponds to the annual deep minimum in the seasonal pressure cycle associated with CO2 condensation and sublimation in the polar regions of Mars and was seen previously by the Viking landers (11). The ASI/MET pressure sensor detected a variety of pressure variations on relatively short time scales. These ranged from seconds to hours and had magnitudes of 1 to 50 μbar. The shorter time-scale variations (<10 to 15 min) appear to be correlated with wind and temperature fluctuations and tend to be largest during late morning and early afternoon, when the boundary layer is most turbulent. The most dramatic pressure features were minima of 10 to 50 μbar, usually less than a minute in duration, associated with vortices (dust devils) passing over the lander. A particularly good example was seen during the continuous sampling of sol 25.